Just in time for Thanksgiving! This Skinny Pumpkin Cheesecake is a great pumpkin pie alternative. Cheesecake can be really heavy but this one isn’t. And it’s easy to make. So if you are looking for something a little different for your Thanksgiving dessert, give this healthy dessert a try. You will be amazed by how delicious this light cheesecake recipe tastes @ only 11 Weight Watchers Freestyle Smart Points! Although cheesecake is not hard to make, if you have one bad experience, it can turn you off ever making it again. And because cheesecake is prone to cracking, I often use a water bath. But you don’t even need to use a water bath with this recipe. It will crack a little, but the topping covers up any cracks, so it still looks great! And it won’t dry out. However, if you always use a water bath and prefer it to be on the safe side, then go for it! And lastly, if you want to learn how to make a water bath, then watch this video on how to make a water bath for cheesecake! I like her trick of using a bigger pan to protect the cheesecake, but you can also tinfoil. This has been my go-to cheesecake recipe for years. I once brought it to work and the recipe was requested by quite a few people afterwards. Then one coworker came back to me and said his wife made the cake, but it didn’t taste like mine. I guess I had changed a few simple things (i.e. sprinkling the icing sugar and cinnamon on top) and hadn’t included that in the recipe. Apparently my changes had made all the difference. Live and learn. Now I always include MY changes in recipes I share. Originally, this recipe had a gingersnap crust, which was good, but I much prefer the chocolate. However, if that sounds tempting to you and you want to crush up ginger cookies and use them instead of the oreo cookie crumbs, you are more than welcome to. 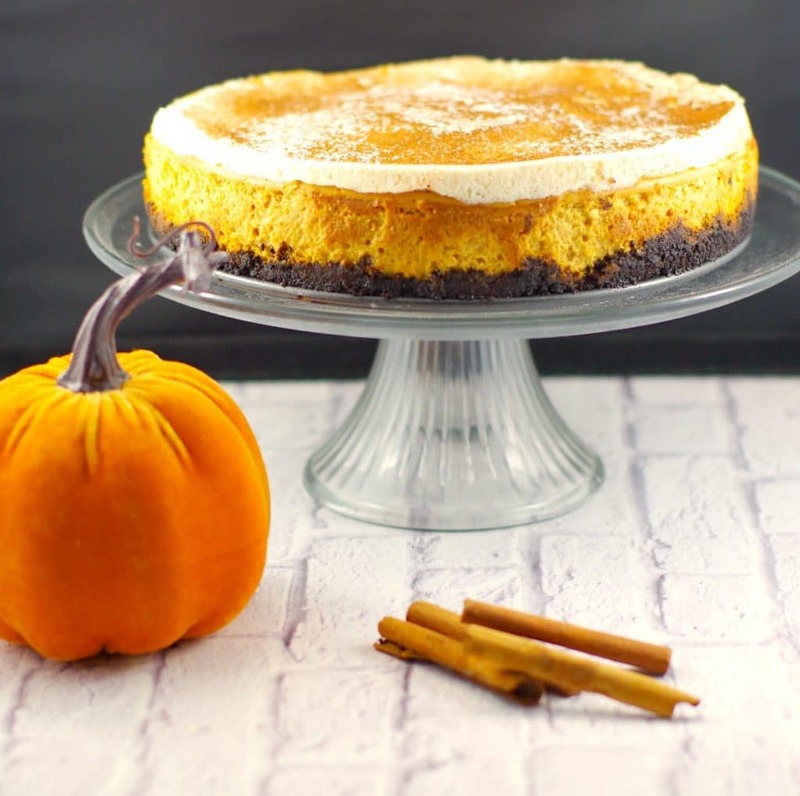 Either way, give this Skinny Pumpkin Thanksgiving Cheesecake a go- you won’t be disappointed! A light and delicious cheesecake made with pumpkin and a chocolatey oreo cookie crust. 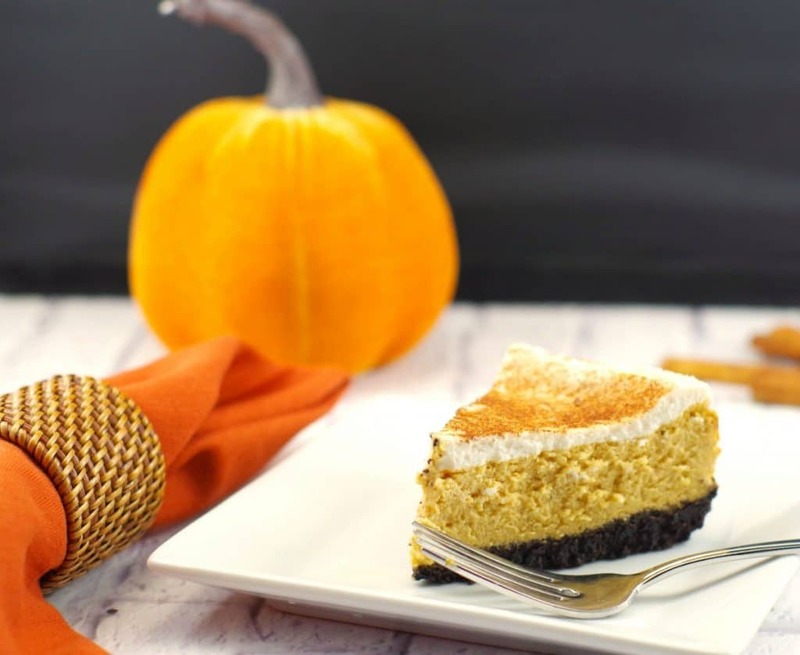 This skinny pumpkin cheesecake, @ 11 Weight Watchers Freestyle Smart Points, makes a great Thanksgiving dessert idea and is the perfect pumpkin pie alternative! Preheat oven to 350 degrees F.Stir together all crust ingredients in medium sized mixing bowl. Spray a 9" or 10" springform pan with non stick cooking spray. Press the mixture onto the sides and bottom of the pan. Bake in a preheated 350 degrees F. oven for 10 minutes. Cool on a rack. Cube the cheese and beat with electric mixer. Beat in the sugars. Add the eggs and egg whites and best until mixture is smooth and fluffy. Mix in the pumpkin, salt, flour and spices. Pour filling onto cooked crust. Return to a 350 degrees F. oven and bake for about 35 - 45 minutes or until puffed and set. It will still be a little jiggly when you shake/move it from side to side and the sides will have separated from the edges of the pan. But you will see it is puffed up a little around the center ** I advise you check it after 35 minutes, as that's what the original recipe called for. Although, it always took 45 minutes for me. Remove cake from oven and spread the topping over the cheesecake. Return to oven and bake 10 minutes longer. Chill in fridge for 4 hours or overnight. ***TERRI'S TIP: Be careful when you are buying light cream cheese, as the fat contents vary greatly between brands. I find most of the store/no name brand fat content is substantially higher (almost the same as regular cream cheese) than the brand names. I generally stick to the brand names for light cream cheese. I prefer to chill this overnight, but it can be chilled in 4 hours. Great – hope you enjoy it! Tastes even better with real pumpkin, as opposed to canned. Do you have access to pumpkins right now? We don’t have pumpkins here but I saw a can of pumpkins in the grocery store or other option would be the butter squash. You think that would taste good as well? Hi, from what I’ve read that substitution should be fine! Just make sure it’s pureed really well. I have made the mistake of not pureeing it enough and it comes out stringy. Happy baking! 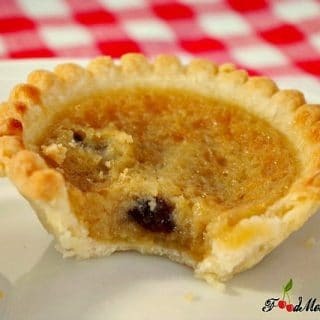 This recipe is easy to make and makes a wonderful treat for any special occasion. I baked it in a 9 x 9 pan, cut them into squares to serve in paper cupcake holders at a bridal shower. I’m so glad you liked it, Susanne! Great idea to bake it in 9X9 square and serve as mini cheesecake squares :)!